The Austin "Greyhound" represents one of the latest efforts to produce a fast quick climbing two-seater, fighting and reconnaissance biplane In general arrangement it follows standard practice. The fuselage carries in its nose a 320 h.p A.B.C.  Dragonfly " engine A conical cowling covers the engine in with the exception of the cylinder head>, the shape of the cowling being preserved throughout the length of the fuselage by fairing. There is almost equal fin area above and below the fuselage. The upper main plane trailing edge is cut away, and the lower plane is of lesser chord than the upper, thereby giving the pilot a good view. Accommodation is made for the machine to carry three guns, camera, wireless, oxygen apparatus and heating apparatus. Name or type No. of machine "Greyhound"
Purposes for which intended Fighting and Reconnaissance. Engine type and h.p. A.B.C. "Dragonfly", 320 h.p. bottom plane, 36 ft. 7 in. Gap 4 ft 11 7/8 In. Maximum height 10 ft 4 in. bottom plane, 4 ft. 3 in. Total surface of wings 400 sq. ft.
Span of tail 12 ft 9.5 In. Total area of tail 47 sq. ft.
Area of rudder 9.9 sq. ft. Weight of machine empty 2,050 lbs. Weight per h.p. 10.3 lbs. Tank capacity in hours 3 hours. Speed at 10,000 feet 130 m p.h. Climb. To 10,000 feet 11 minutes. Greyhound. 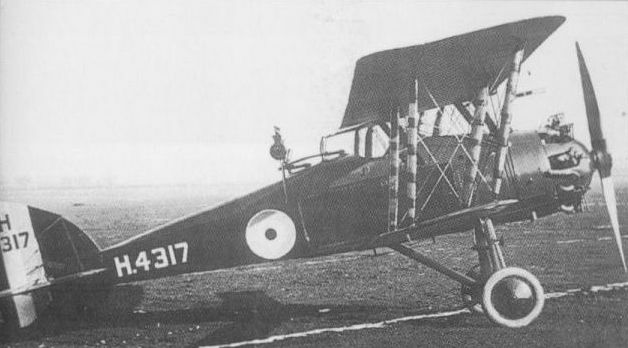 Designed in 1918, like its competitors the Bristol Badger and Westland Weasel, this intended Bristol Fighter replacement had two close-set, internally mounted synchronised Vickers guns firing through ports in the nose and a Lewis gun on a Scarff ring-mounting almost flush with the decking atop a narrow fuselage, which allowed an extensive field of fire. Fighting effectiveness was enhanced by the closeness of pilot and gunner. The reported ammunition supply of 1.700 rounds may indicate 500 rounds per gun for the pilot and seven double drums for the gunner. 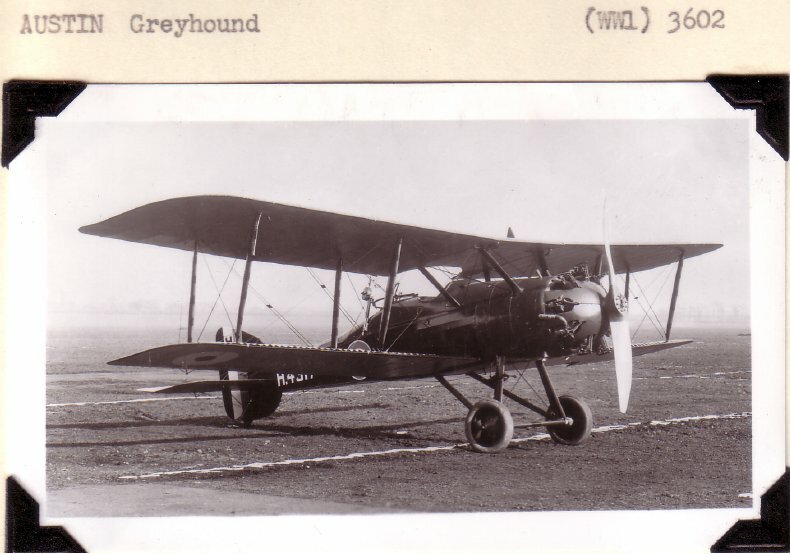 The Greyhound tandem two-seat fighter-reconnaissance aircraft was designed by J Kenworthy as a potential successor to the Bristol Fighter, but the first prototype was not completed until after the Armistice of 1918 owing to difficulties with its 320 hp ABC Dragonfly I nine-cylinder radial engine. Flight testing eventually commenced in May 1919, and three prototypes were built and flown, but no further development was undertaken. Armament comprised two fixed synchronised 0.303-in (7,7-mm) Vickers guns and a single 0.303-in (7,7-mm). Lewis gun on a Scarff ring in the rear cockpit. Max speed, 129 mph (207 km/h) at 6,500 ft (1 980 m), 126 mph (203 km/h) at 10,000 ft (3 050 m). Time to 10,000 ft (3 050 m), 10.83 min. Empty weight, 1,838 lb (834 kg). Loaded weight, 3,032 lb (1375 kg). Span, 39 ft 0 in (11,89 m). Length, 26 ft 8 1/2 in (8,14 m). Height, 10 ft 4 in (3,15 m). Wing area, 400 sqft (36,16 m2). The Greyhound was envisaged a potential successor to the two-seat Bristol Fighter. THE AUSTIN "GREYHOUND." - This machine is designed to carry three guns, camera, wireless, oxygen apparatus, etc. It is a two-seater, and is fitted with a 320 h.p. A.B.C. "Dragonfly" engine. The weight empty is 2,050 lbs. and fully loaded 3,090 lbs. The speed at 10,000 ft. is estimated at 130 m.p.h., and the climb to 10,000 ft. at 11 mins. The landing speed is about 45 m.p.h.